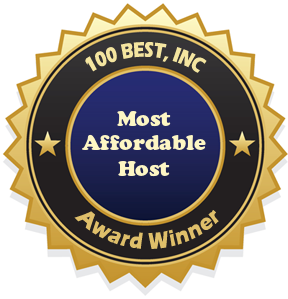 100 Best Free Web Space is proud to announce Gossimer as our “Best Affordable Host” award winner! With web hosting plans as low as $2.79/month, how much more affordable can you get? At this price anyone can afford to have their own website. Since 2001 Gossimer has been providing quality web hosting and domain registration services at very affordable prices to individuals and businesses. With many web hosting companies coming and going every day we feel this is an important piece of information, as we want to recommend web hosting providers that will be here to take care of our readers. Gossimer offers 4 levels of shared web hosting plans in both Linux and Windows platforms. Unlike many other web hosting companies, the Gossimer include the same amount of web space and bandwidth for the same cost, whether you prefer Linux or Windows. However, the number of email account vary by minimal amounts, which is not a huge concern to most shared web hosting customers. And whether you choose the Linux or Windows hosting, Gossimer will provide you with one of the most popular control panels available in the market – cPanel or Parallels Plesk. Gossimer also allows you to choose the content management system that works best for you, choose from Nucleus, Joomla, Drupal, or b2Evolution. The osCommerce shopping cart solution is available for those clients building an eCommerce website. Gossimer’s free website builder allows you to choose from many unique designs and templates, create and modify your web pages, upload your own images or use stock photos, edit your blog, and is SEO optimized. Gossimer has partnered with Thawte to provide their customers with the option of adding additional security to their websites. Even though all Gossimer websites are protected by a SSL secure server, if you plan to do any business via your website, you may wish to consider purchasing your own SSL certificate through Gossimer. The Gossimer pricing on Thawte SSL certificates is very reasonable and comes with a bunch of added benefits. Get up to 256 bit encryption for just $34.00 a year. Gossimer also carries Thawte web server certificates, SGC SuperCert, and Wildcard Server Certificates. Compare certificates at Gossimer.com, under the digital certificates tab, to see which one fits your needs. Free Email Account – with 50 MB personalized space. Domain Theft Protection – Lock your domain. Domain Forwarding – Automatically forward to other websites. Chat & Collaboration Tools – Enable coworkers to chat. DNS Management – Manage your DNS records, email, sub-domains, aliases, FTP and more. Privacy Protect – Protect your personal information on WHOIS. Easy to use Control Panel – Industry leading control panels. All Gossimer web hosting products and services are backed by an excellent support team. Should you have questions or concerns about your web hosting you may choose to contact them via email, live chat, or via your control panel. This entry was posted in Uncategorized and tagged Best Affordable Host, Gossimer Review. Bookmark the permalink.